MND Group is the largest company in Czech Republic specialized in exploring, searching and extracting crude oil and natural gas and the owner of the Uhrice UGS. MND also constructs and operates underground gas storage facilities that feature high flexibility and fully automated control system. Its business activities are spread all over the world, mainly in Europe, Near and Middle East, in North Africa and other countries. The company holds 13 exploration licenses for territories around the world. MND detected a problem in the distant underground gas storage, mainly in the gas drying unit suspecting pressure losses in the refrigeration system. The company looked for a suitable solution enabling 24/7 remote diagnostics and data logging of the drying unit to confirm any spurious pressure fluctuation and other uncommon failures. Mr. Frolka, technician of MND: “We looked for a logging device that could be easily and quickly installed into the current control system. We knew there was a problem, but we could not diagnose it without constant contact with the system”. MND decided to equip the existing control system with mySCADA Box 3G. A Ethernet/IP connection between the ControLogix PLC and mySCADA Box was established without need to shut the system down. It was necessary to log the data from 7 gas pressure convertors and 2 temperature sensors. 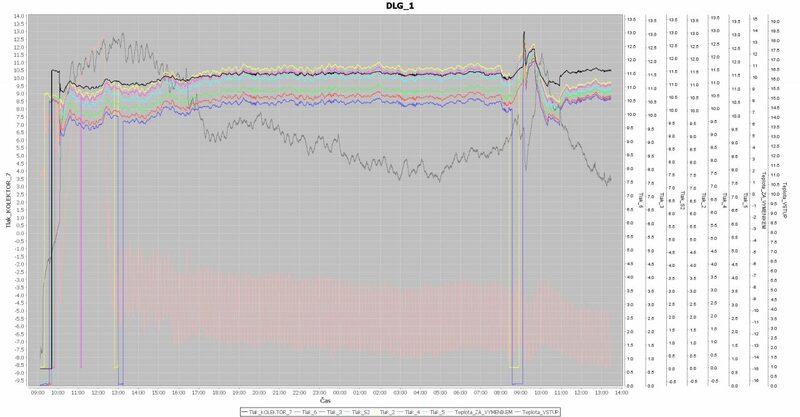 Data were logged with 1-second precision with hysteresis detection. mySCADA Box was capable to log into its internal memory over 28 000 000 of analog values to achieve data history of more than 5 years of continuous system monitoring. GSM 3G module of mySCADA Box allowed for secure connection from remote PC without need for additional infrastructure. Such connection made possible to monitor online actual and historical date from the controller. With the freely available reporting software myREPORTS this data could be displayed in graphic form and transferred into reports to perform advanced diagnostics. Frolka: “We diagnosed a short periodic pressure loss at 9:00 in the morning as shown in the report below. With a single click we got an overview of the system performance. This information was very helpful – we detected the technical problem and configured the system to the maximum consistent performance. MND use myBOX on periodic basis for online monitoring and statistical evaluation of their control systems.